Looking to outfit your drone with an action camera? From GoPro to Runcam, we cover everything you need to know about purchasing your first drone action camera in this article. What is an action camera used for? Racing drone FPV cameras provide low latency video that we view through our FPV goggles. This allows for quick maneuvering, twitchy gate hitting, and accurate flight. However, this low latency video comes at a price: crappy quality. While there are multiple ways to record footage from your FPV camera, the end result from an analog signal isn’t going to be pretty. Why can’t we use an HD action camera as our FPV camera? The latency problem. 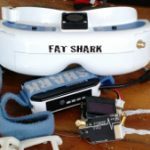 You absolutely could use a GoPro as an FPV camera (and many used to) – but there would be a ton of lag between what your quad does and what you see in your goggles. If you are flying around a slower camera drone this latency isn’t a huge deal. However, for an FPV racer traveling at high speeds, low latency is basically required for any technical flight. GoPro’s Karma drone uses a Hero 5 to display FPV video. Works for a camera drone – not so much for a racing drone. The addition of an action camera to our setup allows us to easily capture HD video and leave the FPV camera to do the low latency heavy lifting. 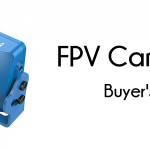 If you want to read more about FPV cameras, you should check out our FPV camera buyers guide here! Thus, an action camera is not necessary for flight. In fact, we recommend most beginner hobbyists wait to purchase an action camera until they get a fair amount of flight time in. You can expect to spend anywhere between $80-150 for an entry level camera, which might be equal to the cost of your entire quadcopter! Start looking at higher end models, and you are in the $300-400 range. However, if you have some experience and are looking to capture and share your flying in glorious HD, an action camera is a great accessory to add to your quad. 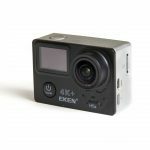 What factors should I look at when choosing an action camera for my quadcopter? Unlike our other buyers guides that focus on the technical points up front, action cameras are a bit different. By and large, action cameras are a great addon accessory and are by no means necessary for flight. Thus, you want to get an action cam that works well with your quadcopter setup before diving into the technical details of the camera. First, you should look at what your frame setup allows for action camera mounting. If a manufacturer offers a camera mount with their frame, it will likely be for the community favorite camera. 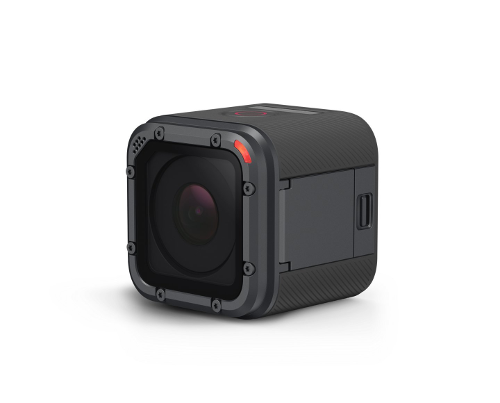 Currently, the GoPro Session “cube style” camera is the most mount friendly standard. The even sides and small design allow it to take minor space on the frame. Thus, many designers offer Session mount cases or prints for their frames. However, that doesn’t mean you can’t use a different camera. It really depends on your frame and the mounting solutions available to you. If you are rocking a compact true-X frame, it can be very hard to safely mount a larger camera like a GoPro Hero or Runcam 2. 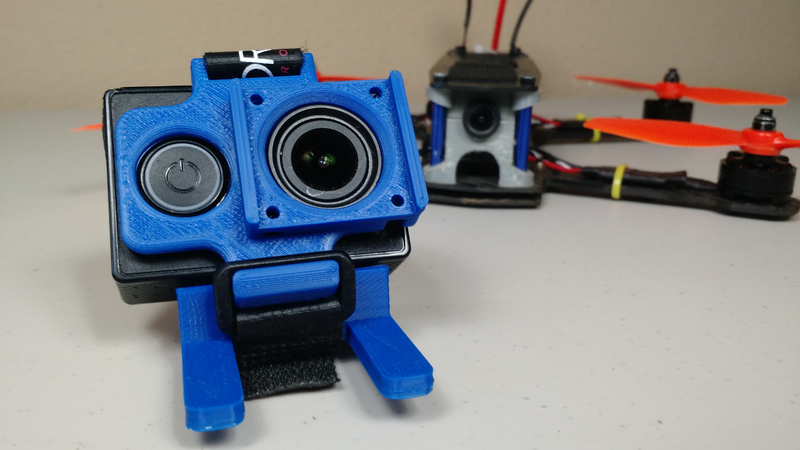 On the other hand, if you are running an H or asymmetric-X frame with a flat top, you can carry a larger camera, but need a mount that provides the desired camera tilt to match your FPV camera’s angle. Custom 3D printed action camera mount we made for the Xiaomi Yi Action Camera. Thus, it comes down to the mount. Have a 3D printer? You can always rig up your own mount, or go on Thingiverse and download a printable model for your frame and camera combo. If you don’t have a 3D printer, your options are limited to what retailers offer. Again, some retailers will offer mounts for the most popular cameras – but you will need to do your homework to find out for sure. One thing’s for certain: if you have a niche camera, it can be much harder to find a mount that fits properly on your frame and protects your action camera from crashes. Let’s address the elephant in the room. Currently, GoPro makes the best-in-class action cameras. Their cameras have always been on the bleeding edge with regards to shooting quality video, and your favorite YouTube pilots likely either rock a Session or Hero 5 to capture crisp and clear video. However, a top of the line GoPro is likely way beyond the budget (and a poor investment) for MOST miniquad pilots. Think about the logic of putting a $400 camera on a $200 quad. Lose your quad? Now your $200 loss is a $600 loss. $400 is a lot of camera for some miniquad footage. Additionally, action cameras have a nasty tendency to get hit first in a crash, as they stick out above your frame. Clipping a low gap or landing upside down after botching a roll could make for a much more expensive crash than you expected. 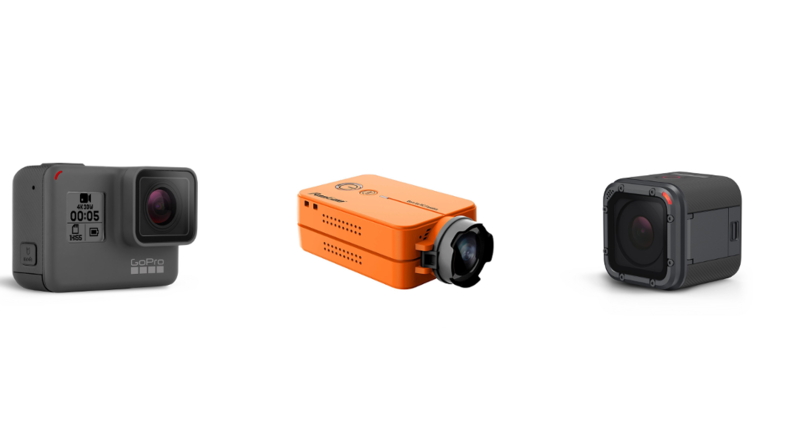 While our miniquads are surprisingly durable, most action cameras aren’t. Therefore, really consider your budget when selecting an action camera. That cash could be spent on other upgrades to improve your actual flying experience rather than capturing a loop in 4K. I would argue that the high-end Hero 4-5 series of GoPros should only be used by pilots aiming for some sort of sponsorship (professional flying) or with a ton of money to burn. Additionally, putting a massive action camera and mount haphazardly on your frame could cause a few unexpected problems. We’ll talk about weight in the next section, but another issue that rarely gets discussed is RF leakage or interference. An action camera that doesn’t have proper shielding could affect your video or RC control range. While this isn’t a worry with name brand cams like GoPro and Runcam, this could be more of an issue with off-branded budget cameras. Unfortunately, there is no real way to know about this without searching the Internet for reviews on the camera. We recommend searching RCGroups to see if anyone has any negative experience. Moreover, if you are running a compact build, be wary of placing your action camera mount + camera combo over any antennas. This could easily affect both your video and receiver’s range and applies to all cameras – not just the low end ones. Trying to set the best lap times or pull off some technical freestyle? The action camera and mount’s added weight should be a consideration if you are looking to completely optimize your flying platform. For most pilots, this shouldn’t be an issue, as modern miniquads can handle an action camera and mount with minor performance impact. However, if you are flying a smaller 4” prop or 180mm frame, adding an action camera could cause a noticeable performance decrease. Moreover, if you are a serious racer looking to eke out every performance advantage you can get, be wary of the added weight. You may be better off capturing footage from your FPV camera rather than adding extra weight with an action cam if you are trying to shave fractions of a second off your lap time. Commonly abbreviated to FPS, the frames per second indicate how many video frames (basically – pictures) are captured every second. Common FPS numbers on action cameras will usually be found in increments of 30: 30 frames, 60 frames, 90 frames, and 120 frames. The higher the frame rate, the more frames captured. This is good for our twitchy FPV flying. Using a higher FPS setting helps reduce some of the jaggedness in our fast twists and turns, as we capture more frames between starting point A and ending point B. Similarly, higher frame rates allow you to better use effects like slow motion to highlight or transition between scenes. The downside of higher FPS: more recorded frames means more recorded data. You will want a larger SD card if you are capturing high FPS HD video. Another downside is usually price. If you want to film at least 1080P resolution, and above 60FPS, you are going to be reaching outside the limit of budget and mid-range action cameras. The display resolution the camera captures video at. You will frequently see numbers like 4K, 1440P, and 1080P. These are all HD, 16:9 resolutions that will provide fantastic quality. If you have ever customized a TV or computer monitor, you probably have a reasonable understanding of the quality differences in increased resolution. As you go up from 1080P, quality increases along with file size. You are capturing a larger number of pixels in each recorded frame as the resolution increases. If you are recording general flying footage for editing, 1080P will be plenty to share with your friends on YouTube. Going up to 1440P or 4K is nice if you have the option, but usually comes at a cost – either in frames per second or camera price. Cheaper cameras may offer a 1440P or 4K option, but usually at a frame rate that is not optimal for capturing FPV footage. For the most part, aim for a minimum of 1080P resolution and a minimum 60 FPS. This resolution and frame rate pairing will give you a fantastic end result. All of the cameras on our list at minimum can match this 1080P / 60FPS “standard”. Field of view (FOV): The amount of the scene captured, usually measured in degrees. A wider FOV will capture a larger area in front of the camera. This can be great for capturing details and “seeing” more around the camera. However, set the FOV too high and you can get a fish-eye lens effect that stretches out the edges of the frame. Almost every action camera has some way to adjust the FOV. This is a highly subjective setting, as it completely depends on what type of flying you are trying to capture and how you want the end result to look. Microphone: Again, this is highly subjective. Some people hate quadcopter videos with motor noise while others love them. Outside of GoPro, most action camera mics are going to do a horrible job of capturing the noises of your quadcopter and your videos will often end up just sounding like a hurricane. WiFi: For the most part, this indicates the ability to control your camera over WiFi. Handy if you are at the field and want to stop and start recordings or adjust settings just before takeoff. Additionally, a few action cameras allow you to update firmware over their WiFi apps which is extremely convenient. Just be aware that having WiFi on will reduce the range of your RC control link – make sure you shut it off before you go fly! Battery life: All these cameras charge via USB, so a spare USB charger or battery pack should do the trick during downtime. Depending on your average flying session time, you might consider battery life when deciding on an action camera. If you are planning to shoot for a few batteries of acro, this probably isn’t an issue. However, if you plan on using a camera for long periods of flight or an entire day at the field, you may want to look at a camera with a longer battery life or removable batteries. Before we jump into our recommendations, let’s talk about the final addons you should consider when purchasing your action camera. If you want to capture high frame rate HD footage, you want a storage card that can keep up with the action. Look for “Class 10” or cards labeled with a circled “10” on them. This is the speed classification for SD cards. Class 10 supports a minimum sequential writing speed of 10MB/s – perfect for 1080P recording. In other words, don’t go digging around the house for an antiquated memory card you used in a camera ten years ago. If you are using a modern action camera and recording HD footage, get a decent SD card. 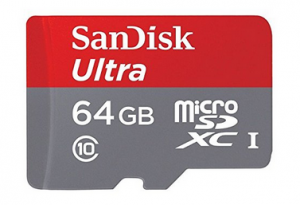 A new 64GB class 10 micro-SD card will set you back only $23. You may want a more advanced card if you are moving up to higher resolution (4K) or higher frame rate (1080P +60FPS). The SD association now has a video speed classification for capturing larger resolution files. Look for V10, V30, V60, and V90 cards if you are serious about filming in higher frame rates at high resolution. The number in the “V#” nomenclature stands for the sequential write speed (V60 = 60MB/s). If you are shooting consistently in 4K, you might consider a V60 card. For the most part, the camera lens will be the weak spot on most action cameras. With our tendency to bump into obstacles while flying, it’s just a matter of time until the wrong branch, fence, or odd metallic object makes contact with your camera lens. To add a further layer of protection, consider getting a lens protector for your action camera if it is offered. Remember though, your first layer of protection is your action camera mount. Be sure to look for a mount that protects the lens as much as possible. Finally, a word on insurance. Many action cameras offer break and replace packages for a small adder. Some retailers, like Amazon, offer replacement and accident protection at checkout. We know many people in the hobby that swear by these and use them to ‘protect’ their cameras. Crash hard and break your camera? Simply return it for a replacement. However, be careful how you file a claim. Many accidental breakage policies limit exactly what they cover. We have heard that many are starting to limit their liability of coverage on cameras broken related to use on drones. That isn’t to say you couldn’t say the camera broke in another fashion, just be aware of what your policy covers and what it does not. Additionally, most of these services have a limit to the amount of times you can make a claim. 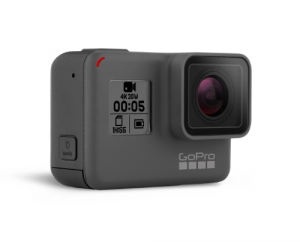 GoPro’s break and replace plan will replace up to two cameras, with a processing fee on each replacement. Squarespace and other retailer brands will usually only replace the first camera, and require a new policy after. Again, this comes down to reading what you are paying for before purchasing the service. Don’t pay for something you can’t use. So now that you know what to look for, lets dive into some of the action camera options you have for your quadcopter. NOTE: The GoPro Session series was end-of-lifed late 2017. You can still pick up a GoPro Session at a discounted $115 price point on Amazon. Get them while they last – they probably won’t stock more after 2018 is done. The GoPro Session is hard to beat. The small form factor allows for easy mounting and camera tilt without taking too much space on your frame. There are tons of Session mounts available for most frames and a lot of 3D printable options on Thingiverse. Additionally, the camera is easy to use with its one button interface. The basic Session model’s quality is solid with options of 1440P resolution and 30 FPS or 1080P at 60 FPS. As mentioned before, we would recommend flying using the 1080P60 setting to get the best mix of resolution and increased frame rate for twitchy flying. The Hero 5 Session version can hit 4K at 30 FPS, 1440P at 60 FPS, and 1080P at 90FPS. Most of your favorite YouTube pilots are rocking a Hero 5 Session on their quads today. However, these features come at a price… literally. The GoPro name will set you back $150 for the standard older Session model. While this is an easier pill to swallow than a $400 top of the line GoPro Hero, $150 still might be about equal to the cost of your entire quadcopter setup. The 4K Session Hero will set you back $300 if you decide to go with the top of the line version. However, we have a hard time recommending this to most pilots. Unless you have money to burn or have the skills and editing chops to get sponsored, stick with the basic model at half the price. If you are a newer pilot still learning the ropes (and crashing a lot), a Session may be a bit too much when outfitting your first quad. However, if you are a more seasoned pilot looking to capture stunning video, the Session is a hard product to beat. Great for: Experienced pilots looking to capture awesome video using a mount-friendly form factor. Not for: Newer pilots who’s entry level quad costs more than the camera. Mounts well on: Pretty much any frame. Currently the standard action camera 90% of frames will support. Session Hero 5: Amazon – $299.00 – Now $199 and dropping for EOL sale. Session: Amazon – $149.99 – Now $115 and dropping for EOL sale. The quintessential action camera. For over a decade, GoPro has iterated and made impressive technological leaps on their action camera series. There’s a good chance you might have one of their older cameras stashed away somewhere in your house. Tech wise, this camera is unsurprisingly a beast. 4K resolution at 30 frames, 1440P at 80 frames, and 1080P at a whopping 120 frames. Additionally, GoPro offers a bevy of customization features such as stabilization, wind reduction, and more. This is without a doubt the professional level action camera. Obviously, the best comes at a hefty price. For the current version, you are looking at dropping $400 to put one of these on your quad. Ouch. To me, the Hero series in the classic GoPro form factor makes some sense if you have multiple hobbies you want to share and need the best possible video. You can find mounts and accessories for nearly any activity – off-roading, surfing, snowboarding, whatever. If you have a ton of expensive hobbies, money to burn, and need the highest quality capture possible, who am I to argue against the Hero 5? However, if you are looking for an action camera specific to FPV, I would recommend the Session series over the standard Hero series. Additionally, if you are looking at the Hero series, consider the older models. Many retailers sell refurbished or old runs of previous year’s model. Some great deals can be had if you are willing to hunt around for an older camera. However, most of these older or refurbished models will not have a warranty or option to purchase replacement insurance. Great for: Serial hobbyists that want to capture the best quality video possible. Pilots who want to shoot slow motion or high-quality shots above all else. Not for: 90% of pilots. This is more camera than you likely need, flies heavy, and you are one mistake away from a very expensive crash. Look at the Session instead. Mounts well on: Heavier, more powerful racers. 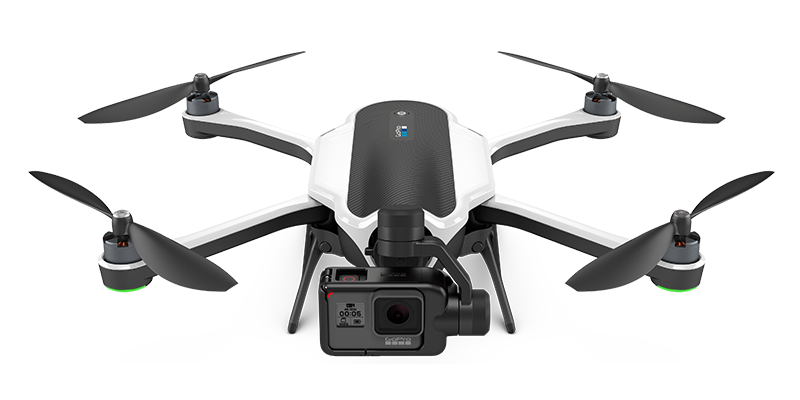 The GoPro Hero series can be heavy, and you are going to need a quad that can handle the added weight of the camera + mount. New to the scene, the RunCam Split attempts to remove the necessity of an action camera completely. The RunCam Split functions as both an FPV and action camera. The camera is connected to a small micro-SD card equipped PDB that sits on your flight stack. The idea being, you install the Split in place of your FPV camera, add the PDB to your flight controller stack, and wire everything together. Tech wise, the Split records at an impressive 1080P and 60 FPS. Fantastic for a camera that functions as both a 4:3 FPV camera and a 16:9 HD action camera at the same time. What’s the catch? Well with any new tech improvements, there are always going to be issues. First, your frame needs to be large enough to accommodate another PDB in your flight controller stack. If you are flying a low-profile frame and already aching for space, this is an almost immediate hard stop. Additionally, there is no built-in voltage regulator. You are going to need to either have a flight controller / PDB combo that has an onboard 5V regulator, or use an external regulator. Not the most elegant solution, and likely an immediate turn-off to the less tech savvy pilots. We love that RunCam is challenging the status quo and potentially moving the hobby away from requiring a separate expensive camera. At a price of around $70, it is definitely competitively priced. Hopefully future iterations will make the installation and use process a bit easier. Great for: Early adopters looking to outfit their quad with the latest tech. Frames that have weight restrictions or inability to mount a standard action camera. Not for: Less tech savvy hobbyists that are still new to flying quads. Low profile builds that don’t allow for an additional board in the flight controller stack. 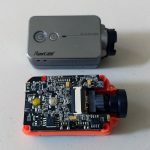 You can read our RunCam Split review here! 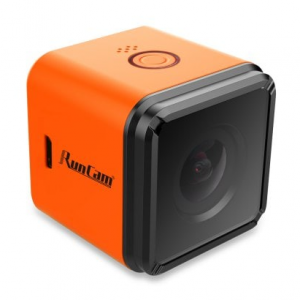 The RunCam 2 was built to be an action camera purposely designed for FPV. Featuring a low profile, lens protection, and a simple control interface, the RunCam 2 is a great entry level camera. Even at the $80 price point, the RunCam 2 still offers 1080P resolution with 60 FPS. We have captured a ton of video using our RunCams and were always pleased with the result. Additionally, the camera is WiFi enabled, allowing for easy troubleshooting and firmware updates. However, there are two major downsides to this camera. James and I have collectively broken or badly damaged three RunCam 2’s from landing upside down and crunching the power button. This may have been fixed in later revisions, but if you are flying loopy freestyle you have been warned. Definitely invest in a mount that covers the top of the camera. Speaking of the camera mount, the other major downside to the Runcam 2 is its form factor. The long and flat camera body requires a larger mount to obtain any real camera tilt. This isn’t a deal breaker, except the RunCam 2 does struggle on single stack frames like a true-X. The RunCam 2 design came from a time when the Mobius action camera was the go to budget camera used by RC hobbyists. This stick design was great for RC airplanes and quads with very little camera tilt. However, as pilots have gotten more aggressive with their flying and need for additional camera tilt, the Runcam 2 has become a bit more cumbersome to mount. RunCam attempted to rectify this with their GoPro Session-like RunCam 3, but mysteriously discontinued it in the US in early 2017. Despite its issues, we loved the RunCam 2 as an entry level HD action camera and would still recommend it today. While it won’t mount as easily or capture as nice of footage as the GoPro Session, the RunCam 2 can be had at nearly half the price. Great for: Pilots wanting to capture great HD footage on a budget. Not for: True-X frames will have difficulty incorporating a RunCam2 mount into their flight stack. Hard to mount if you do not own a 3D printer. Mounts well on: Flat top frames (H and asymmetric-X frames like the Wizard, ZMR, Bolt, etc.). 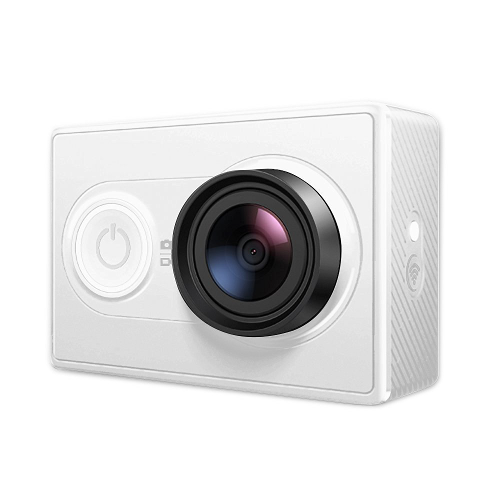 Clearly modeled after the GoPro Hero, Xiaomi offers an affordable entry level action camera with the Yi. We’ve used the Yi quite a bit, and were happy with its performance at its price point. Again, this camera is capable of 1080P, 60FPS recording. Like the GoPro, it is also WiFi enabled to allow for settings adjustments and customization on your phone. All in all, if you are looking for a budget way to strap an action camera on your quad, the sub $100 Yi won’t break the bank. Great for: Pilots wanting a GoPro-like form factor at a fraction of the cost. Not for: Pilots afraid of a bit of customization. Does not fit 1:1 in most GoPro mounts: we recommend 3D printing a mount instead. Mounts well on: Same as GoPro Hero recommendations: heavier, more powerful racers. The Yi is heavy, and you are going to need a quad that can handle the added weight of the camera + mount. The RunCam 3 is RunCam’s answer to the GoPro Session. 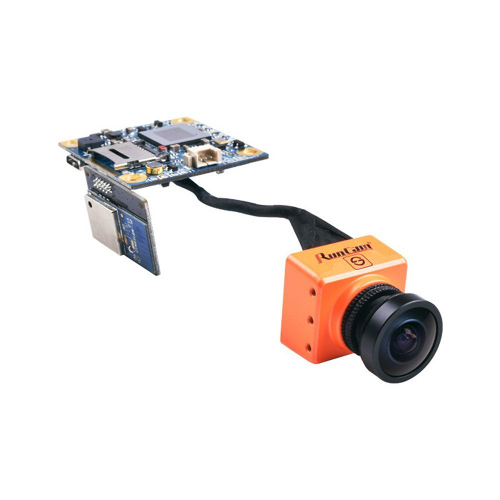 As we mentioned previously, RunCam’s current generation of cameras are purpose built for RC. With the rise of pilots using GoPro Sessions, RunCam clearly saw an opportunity to capitalize on a popular form factor with their third action camera iteration. 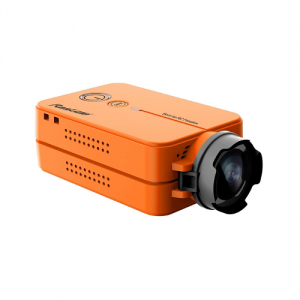 The RunCam 3 can capture 1080P resolution at 60 FPS. The picture quality looks great in comparison tests between it and the Session. Additionally, RunCam took measures to add some nice features such as RFI shielding to help reduce RF interference. Effectively, you are purchasing a Session without some of the resolution options and a few other GoPro specific features, at a cool $100 price point. What’s the catch? Unfortunately, the Session is not available for sale in the US. It is unclear exactly what happened, but near the release of the product, RunCam was forced to pump the breaks and discontinue the RunCam 3 in the USA. Many rumors swirled around that GoPro possibly stepped in with a patent infringement notice, but the exact reason is unclear. Hopefully RunCam is able to change whatever is needed to re-release this camera into the US. Other complaints are minor. The microphone is often mentioned as a weakness, as well as the camera missing some of GoPro’s popular features. At the end of the day though, you get what you pay for. It’s hard to call the RunCam 3 anything other than a bargain for the form factor and video quality you get in a $100 camera. Note: Originally, we stated that the RunCam 3 was not available in North America. One of our readers pointed out that it was available in Canada, and prohibited only in the US. Thanks for the feedback Moses! Great for: Pilots wanting a Session style box camera at a deep discount. Not for: Anyone in the US. Unless you have a friend outside the US that can get you one, retailers are not selling the RunCam 3 in the USA. Mounts well on: Pretty much anything. However, the sizing is a bit different than a Session, so be sure to purchase the right mount. Browse around Amazon, Banggood, and GearBest for a while and you will spot a ton of cheap action cameras from unfamiliar companies. While they may look like a stellar deal for a GoPro Hero lookalike, proceed with caution. Our research gives us a mixed bag of positive and negative reviews. We have personally not used any of these cameras. If you do decide to go with one of these budget cameras, be sure to do your research. Watch videos to check the quality, read some of the positive and negative reviews, and check RC Groups for additional feedback. As always, you get what you pay for. Don’t expect the same performance as a $100+ action camera in the $30-50 price range these cameras run in. Additionally, we have heard that many of these GoPro clones do not fit perfectly in GoPro style FPV mounts. Be prepared to 3D print your own or customize your mount accordingly. Foxeer Box: Reviews have been so-so on this product so far, and we are especially wary of issues that have been brought up with frame doubling on the 1080P/120FPS setting on the camera. We are cautious about recommending the Box at this time. Mobius: As we mentioned above, the RunCam 2 was modeled off the once popular Mobius action camera. However, this camera is starting to show its age, as it is limited to 1080P/30 as its highest recording setting. Given that it is at the same price point as the RunCam 2, we can’t recommend it over the competition. Polaroid Cube: If you are looking at cube cameras like the GoPro Session, you might run across the Polaroid Cube. Like the Mobius, it’s limit of 1080P/30 FPS makes it a lackluster action camera despite its great form factor. It also has been discontinued by Polaroid, so its unlikely we will see any future support for it. Additionally, you can check out our other buyers guides here! These cover everything you need to know about every component on your drone!